The death throes of one of the biggest stars known to science have been spied by Europe's Herschel space telescope. The observatory, launched in May, has subjected VY Canis Majoris, to a detailed spectroscopic analysis. It has allowed Herschel to identify the different types of molecules and atoms that swirl away from the star which is 20-25 times the mass of our Sun. VY Canis Majoris is some 4,500 light-years from Earth and it could be seen to explode as a supernova at any time. It is colossal. If VY Canis Majoris were sited at the centre of our Solar System, its surface would extend out towards the orbit of Saturn. The star, in the constellation Canis Major, has been recorded by astronomers for at least 200 years. It is what is called a red hypergiant - a highly evolved object that is exhausting its nuclear fuel. 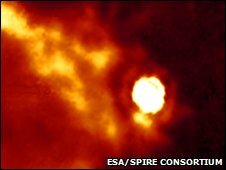 Perhaps once 30-40 times as massive as our Sun, the end days of VY Canis Majoris see it spew vast quantities of gas and dust into interstellar space, including elements such as carbon, oxygen and nitrogen - the raw materials that will go into the production of future planets, and, who knows, perhaps life elsewhere in the galaxy. 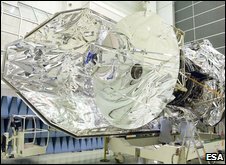 Herschel has trained the spectrometers in its Pacs and Spire instruments on the extensive cloud of material billowing away from the object. Spectrometers capture and split light into its constituent wavelengths, creating a kind of "fingerprint" that will reveal information on the chemistry of a light source. Pacs and Spire, for instance, detect copious amounts of carbon monoxide (CO) and water (H2O) in the vicinity of VY Canis Majoris. "One of the most common molecules you see in this type of observation is carbon monoxide," explained Professor Matt Griffin, the Spire principal investigator from Cardiff University, UK. "That's because carbon and oxygen are two of the most common materials produced in stars and they like to get together, so interstellar space is full of carbon monoxide. From our CO lines we can measure the temperature of the gas and by comparing them with other lines we can also measure density and optical depth and all kinds of other parameters. "The other lines we're seeing in abundance in both Pacs and Spire spectra are water. Water is very important astrophysically because it is a diagnostic - it tells us a lot about the physical and chemical processes going on in a gas. "And of course water cannot be seen from the Earth because there is so much of it in the atmosphere, its signal gets swamped; and that's why we have to go into space to do these kinds of observations." Herschel studies like this should help to establish a detailed picture of the mass loss from stars and the complex chemistry occurring in their extended envelopes. Scientists have models to describe what they think happens in stars like VY Canis Majoris and Herschel will give them some "ground truth" to constrain their ideas. The European Space Agency's billion-euro Herschel observatory was sent into orbit on 14 May on an Ariane rocket. It has been positioned far from Earth to give it an unobstructed view of deep space. The observatory works at longer wavelengths - in the far-infrared and sub-millimetre range (55 to 672 microns). This means it can pick up details that are beyond the vision of other telescopes which operate in different parts of the electro-magnetic spectrum, such as Hubble which is tuned to see visible light and the near-infrared. Herschel is demonstrating it has sensitivity and resolution beyond anything previously sent into space to work in its particular wavelengths. Moreover, there are some parts of the electro-magnetic spectrum that Herschel will show scientists for the very first time. The mission is now entering routine operations after completing commissioning and demonstration phases. However, its third instrument is currently down after experiencing a fault. Engineers are expected to upload the software next month needed to reactivate the Heterodyne Instrument for the Far Infrared (HiFi). The Dutch-led HiFi spectrometer has even better resolution than the Pacs and Spire instruments. A glimpse of its capability is demonstrated in a spectrograph of a comet released on Friday but taken before the shutdown. The data on Comet Garradd shows up a strong water signal as is expected from an object composed of ice and dust. Comets will be a key target for HiFi. 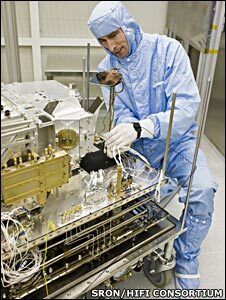 It will be used to pick out the various chemical elements and molecules - some quite complex - that boil off these objects as they sweep in towards the Sun from the outer Solar System and heat up. Some of the first science results from Herschel observations are expected in the coming weeks. "Everything we have done so far, we've done extremely well," said Dr Göran Pilbratt, Herschel's project scientist. "We have not been able to do everything we wanted because of HiFi, of course; but what we have released today and put on the [Esa website] for instance, you can judge for yourself. I think it is very impressive."